Public Bus: Public buses on the Alajuela to San José route stop in front of the airport (after you exit go around the parking garage that is directly in front of you and catch the bus on the side opposite the terminal) everyday from 5:00 a.m. to 11:00 p.m. about every ten minutes (15 minutes after 7:00 p.m.) and costs ¢810 (¢–colón, the currency of Costa Rica, US = ¢530). This is one of the few times you may need Costa Rican currency, but not exact change. The route ends at Avenida 2, between Calles 10 and 12. 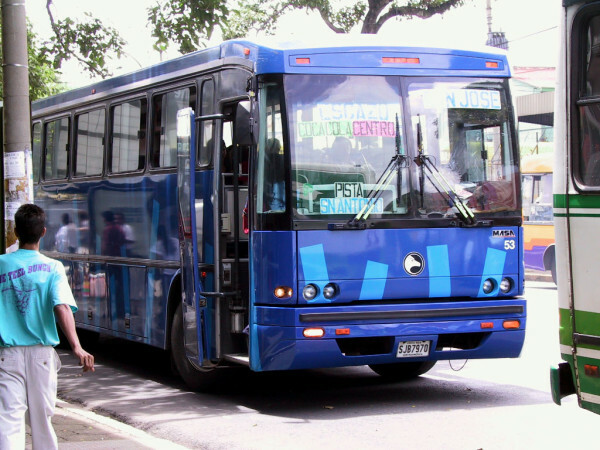 All Costa Rican Public Buses are non-smoking. Taxi: There is a window just as you exit the terminal which will arrange a licensed cab for you. The legal maximum fare to downtown San José is around $US 26, but expect to pay an additional $10 or so for the 30 to 60 minute ride if you are going between about 6:00 am and 7:30 pm because there is a charge for waiting in traffic. If you take a taxi to San José you need to be cautious about accepting the driver’s insistence that he “knows a really nice hotel,” because he may be getting a kickback from the operator of a dump. If you end up at the drivers destination rather than your own and you don’t like the looks of it, just politely insist and point to the listing or map in your guidebook for the hotel you want. Hotel Transfer: If you are traveling on a budget and staying in backpacker hotels, hostels or even moderately priced hotels, it’s unlikely that your chosen lodgings provide free airport pick-up and transfer to San José (free transfers are surprisingly common even in the budget category if you are staying in Alajuela). Upscale luxury hotels generally provide this service. Driving a Rental Car: The main thing you should know about renting a car at the airport is that there is a 12% concourse fee added to cars picked up at the terminal ($US 105 added to a $US 875 one week full size 4WD rental for example). You can pick up your car four or five blocks away (most agencies provide pickup services) to avoid this fee. Please see our page on car rental for recommended agents and cautions about driving in Costa Rica. Driving Directions & Maps: San José is easy to reach from the airport, simply turn East on 1 (the Pan American Highway) at the airport exit and follow the signs.